Top Ten Listed Los Angeles Wedding and Portrait Photographer has a brand new redesigned web site. Photography and Video by Zarek gets a makeover of their web site in bringing it current with the millennial generation’s way of viewing online and adds all the features it needs to keep it current. When Zarek was asked what was he noticing about the way millennial search, here is what he said: “While observing the millennial’s, and having one as well, I noticed that most of their searching took place not only on the phone but they preferred watching videos rather than scrolling through a lot of photos and text.” According to a short survey from Digital Turbine, approximately 81 percent of participating Millennial’s “look at their phones” more times that they can count in a day. Millennial’s prefer watching videos that open on the page that they are viewing rather than a redirect. This was the first step in the creation of the new site. 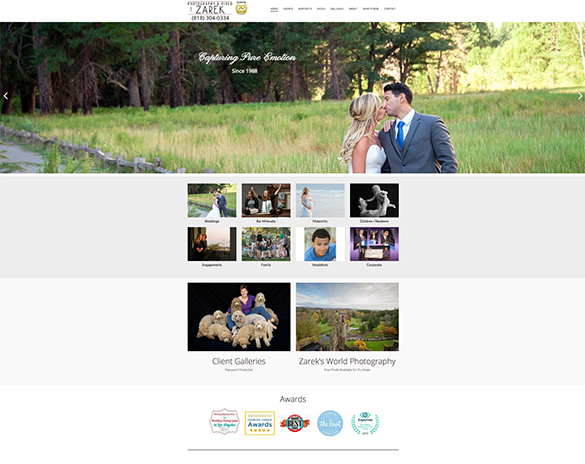 All of the various photography services offered now have their own video montage showing all the amazing photos taken by Photography and Video by Zarek. For example, under events select weddings and you will find a music montage of photographs from a variety of weddings at various locations throughout the country. You can easily choose another category of photography and enjoy another photo montage beautiful images that really capture the pure emotion of the person or persons in the photograph. The next step to bring it current was the addition of social media. Everything must connect. Facebook, LinkedIn and Instagram are just some of the ways we all stay connected. Each of these social medias have a different purpose and also tend reach a different generation. Some of the pros of connecting your social media are the ability to promote your brand and increase your reputation. It will help increase the visibility of your web site across the social network as well as the search engines and their rankings. Then linking connecting the videos to my YouTube account as Google owns YouTube and they will go hand in hand raising the awareness of your web site and its rankings. Testimonials are an important factor. In the past, listing your testimonials in text format was just fine, but that all has changed. While text is still fine, video serves as social proof. Here’s why. Video testimonials build trust and are engaging, more so than text. Because you are watching a video, you can see the person’s facial expressions and tonal inflections. You get a real feel for what they really thought about your service . It is more authentic. These things generally do not come across well in text. Your business will also come across as more professional and does not come across as a sales pitch. In addition, this will be as close as you can get to word of mouth advertising through your web site. Zarek has used this well as he has not only added video testimonials, but has numerous “textimonials” as well. His testimonials are also backed up with testimonials from WeddingWire reviews as well as Google reviews. He has done a great job with this section.